The World’s only Japanese maple Birthday Cake! Believe it or not, the Japanese maple in this photo is a birthday cake! Many of our customers know Taylor. She is our customer service specialist and handles all of our incoming Email. Taylor is warm and friendly, extremely helpful. People really, really like and appreciate Taylor. But nobody appreciates her as much as I do. She does a great job and makes my life so much easier. But what most people don’t know, and I just recently discovered, Taylor is extremely talented and makes some awesome birthday cakes. She wanted to stop by on my Birthday and she showed up with this incredible Birthday cake that looks just like a Japanese maple! Yes, the leaves and the pot are edible! The cake is inside the pot! I know many of you are going to ask a bunch of questions about how she does this and what she uses, and I’ll let her explain it. She explained it to me, but all I remember was how good the cake was. Oh yeah, I did eat a leaf or two as well! So there you have it, a Japanese maple birthday cake. Fire off the questions and I’ll let Taylor take it from here. That is incredibly creative – would love to know what the trunk., leaves, & limbs are made of – & the pot as well. the dirt in the pot has got to be chocolate (only because I am a devout dark chocolate lover)! Great looking cake! How on earth did you make the pot and the leaves…? And they’re edible??? Would love to know! Great job! That is so cute. Load the full recipe, please. My baby daughter is into food she is studying at NYU. I would love the recipe for the whole thing, Cake, pot, leaves and all. Nice for our garden club event. Thanks for all of the wonderful compliments on the cake. It really was fun to make, and a very special gift for the best boss ever! The recipe is the easy part, let me just say. It takes a lot of time and patience to make a cake like this. I am going to write out the instructions as simply as I can; it is definitely going to be in depth, though, as that is the only way to explain it! If anyone has more questions, just let me know! The cake I made was just plain white cake. There were lots of kids at the party, so that is the least messy choice. I doctored up a boxed cake mix so I could get the moistness of a boxed cake, but the flavor and firm texture of a from scratch cake. and fluffier, just leave out the sour cream. You can cut the recipe in half, if you would like to make a smaller cake. and line it with foil, though. There are instructions in multiple places online. I thought of this a little too late! and it will be hard to mix in the remaining ingredients if you do too many dry ingredients first. the pan as well, but I don’t as it helps the cake bake flatter and straighter. a bit less fluffy, which is important for carving. a regular boxed cake. The 5 in took about 20 minutes, and the 8 in probably took 35 minutes. The others were somewhere in between. Allow the cake to cool in the pan for 20 minutes, then drag a butterknife against the edge of the pan to loosen the cake. Flip onto a board or tray. After completely cooled, I would suggest wrapping the cakes in plastic wrap, then foil. You can freeze them that way, as well, if you would like. The icing is recipe that I use as a base for all icings. It is a crusting buttercream that is perfect for every cake, including wedding cakes. extract, don’t worry about it. I’ve made it without plenty of times. It just cuts the sweetness a little bit. Using a stand mixer or electric hand mixer, blend the shortening and butter together until creamy. Add the vanilla and almond extracts and mix thoroughly. If you have a sifter, sift the powdered sugar. It prevents any little lumps in the icing. Mix the powdered sugar into the butter/shortening mixture slowly, on low. like bread dough almost. Once all of the sugar is added, mix the milk in one Tablespoon at a time until you get to the desired consistency. and you mix it back up, you may get little grainy chunks throughout the batch. Round cake boards, cut to 4.5 in, 5.5 in, 6.5 in and 7.5 in. Cut each cake in half lengthwise, to make it into two layers. Put a thick layer of icing on the bottom cake, then put the top layer back on. Do that for all of the cakes. Each cake should be placed on a cake board slightly smaller than the cake layer itself. You can buy cake board, or cut them out of cardboard and cover them in foil or plastic wrap. cut the dowel to that length. Cut two more to the same height, then stick them into the cake in a triangle shape about an inch in from the edge of the cake. stack the cakes from smallest to largest, with the smallest on the bottom. Looking at a plant pot or a picture of one, use a bread knife or other serrated knife to carve the cake into the correct shape. Use short, back and forth cuts to prevent crumbling. Cut very small amounts off at a time. You can always take more cake, but you can’t put it back on very successfully. instead of sticking, you can still go back and add in a little milk to thin it out a bit. is probably not the best thing for you to cover on your first attempt. Another option is to just use buttercream icing tinted to the right color, and smooth it as best as possible. to work with, and it tastes horrible. Fondarific is my very favorite, it tates delicious and is easy to work with, but it doesn’t stiffen up as well as the rim of a plant pot should. colors (gel icing colors…don’t use liquid), to get the color. Just orange and brown work just as well, if not better, than the terra cotta color. or powdered sugar. If the fondant feels dry, use shortening. If it feels sticky, use powdered sugar. Once it is all colored and rolled flat, you will lay it over the cake and smooth the top and sides as much as possible, and trim excess fondant away. 1/4 Chocolate, white chocolote, or candy melts, etc. Gumpaste is sold at Walmart, Michaels, cake stores, online, etc. It is like fondant, except stickier, and it dries rock hard. It is used to make wedding cake flowers a lot of times. the stem area of each leaf immediately. Sqish it a little to secure the wire. To get the leaf veins, thinned edges, etc., I used different gumpaste tools. since the wires are so thin. Twist some leaves together in bunches of 2 and 3, randomly, like a real tree. I made thirty leaves, left three single, and put the rest in bunches of two or three. 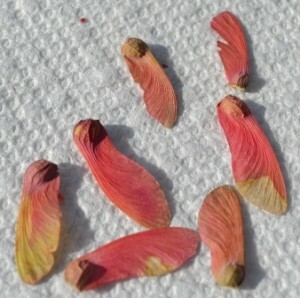 and twist them together, placing the leaves at different heights to give the appearance of a tree or seedling. Wrap with white wire as you go to secure. you will be serving it on, you are ready to put the “tree” in. Make sure the wires are twisted together very well at the bottom and wrap foil around the bottom 6 inches or so. to make a whole to stick the tree into. The wire is not strong enough to break through the cardboard cake circles. until the chocolate dries. It will secure the tree and prevent it from falling over or pulling out of the cake during transport. Crush the cookies to make dirt, and put them on top of the cake. I spread a little more of the melted chocolate over the top of the cake first, to help it stick. I think that is everything…if I forgot to explain anything, just let me know. You can email me, as well. If anyone decides to make one of these, please send me a picture! tell us how you did it. Would love to make a bonsai cake for my husband’s birthday! So so cute! Wow! You’re very talented Taylor. Love, love, love it. Is it made of “all chocolate”? Happy Birthday Mike and many happy years! And what a thoughtful and beautiful birthday cake! I’m with Blair I would love to have the full recipe with illustrations would be nice. 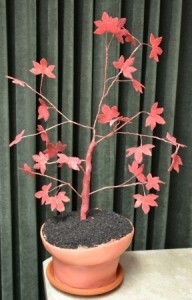 I am getting married in February of 2013 and am planting a Japanes Maple in my yard to commemorate my fiance moving in this spring, so this would be the perfect ccake for our wedding. Sorry I don’t have pictures! If you need more details than I posted to make your wedding cake, email me and I will get them to you! Wow ………. and the entire tree is edible? Maybe you should contact Cake Boss, he may be interested in your unique skill. Great job! Thanks! The entire tree is edible, except for the wire that is the branches. Haven’t figured out how to make something that thin edible, yet still strong! Happy Birthday Mike! “56 and still so slick!” 🙂 Have a good day. You are a springchicken, Mike. On Feb. 13, I will be 73. Hre is another tip. The recipes that contain garlic are useless if the mixture is boiled or canned. The time to add garlic is late in the process before it is subjected to high heat because garlic is very volatile and is soon gone completely. I get a big kisk out of these canned Spaghetti recipes that claim to have garlic flavor. They have nothing of th kind! Happy birthday and try to behave! That is incredible. How does she do it? Thanks, Grace! Lots and lots of patience! That is incredible, how does she do it? I am waiting for recipe too. Is it a chocolate dirt cake? I aeait the recipe. I think my sister-in-law made one without leaf. Valerie, I posted the recipe above, on the first comment. I just used a plain white cake, since there were little kids and it needed to be solid enough to carve for the shape. You could do chocolate, but the dirt cake recipe can’t be carved. I think I need to make a dirt cake now…sounds delicious. I wanted it to be all edible, so I had to use a stiffer, carveable cake recipe. You can come get all the maple trees you want from my yard. They are a nuisance to me. All the helicopters all over the yard. I have three big trees that produce hundreds of little saplings. Come get all you want. While you are at it cut down the big trees. I want Plum, Cherry, English Walnuts, Almond and even Pecan trees. Anything but Maples. I haven’t figured out yet how to eat a Maple tree. Give us some information about propagating Blueberries and other fruit plants. Anything but Maples! I feel like you do, but my nemisis is chestnut trees. I think it’s catkins in June absolutely STINK!!! There is a big one in my yard, and since we rent the place, there is not too much I can do about it except pray for a good wind. Thanks, Kim. It is fun, when I have time to do it. I like to make cakes for family and friends. I love seeing their faces! this cake was made with loving hearts! Wow, this is amazing! Are you doing cakes in your spare time? I would say you definitely have a future in cakes – have you thought of participating in a Food Network competition or something similiar? Talk about Natural Food! I assume it is very low calorie? David, I didn’t taste any calories so I’m thinking it was calorie free!!!!!!!!!!!!!!! Sure love to have the full recipe, where I could make on for your local Garden Club, we meet the first Tuesday night each month. That would nice to have for Febuary, we always have a meal before the meeting, I am helping meat and dessert. Please share if possible. I posted the recipe and instructions as a reply to the first post on the page. It can definitely be altered with different flavors, etc. That is just how I did it. I have heard you can bake cakes inside of clean terra cotta pots…if you have never worked with fondant before, you may want to research that option a bit. That is really awesome. Love the “dirt”, too! would love to see how she created the leaves, pot, etc. I posted the recipes and my methods above. No pictures or videos, though. Maybe next time! TOOO much work for such a simple looking cake. I got dizzy just reading the recipe. By the way Happy Birthday Mike. Dale, I’m not so sure the cake was simple looking, looked quite unique to me. But that makes me appreciate the effort that Taylor put forth even more. Happy birthday Mike here’s to many more wonderful years to come! WOW!!! How did you do that??? Would love to have the recipe and directions.. Thanks! Lots of time, patience, and supplies! The recipes/simplified instructions are posted above. Let me know if anything needs clarified. Hi Taylor, Having been a cake decorator in my lifetime…. I love your very apropos design. What a perfect and “fun” cake for Mike. I’m sure that you had fun designing and making it. I love Mike’s helpful garden videos….and I know that he was super surprised and impressed. Isn’t it fun to put happy smiles on people’s faces with your creative talents? Happy Birthday Mike! I know exactly what you mean. I love to see people smile when I give them a really neat cake! just checking, is there a jap maple that’ll survive south central florida zone 9? Roger, there are many that will do well in zone 9 with a little shade. I’d just try one or two and if you give them some shade they should be fine. Happy Birthday to Mike! What a fantastic cake, Taylor! I’m guessing the “mulch” is chocolate and the leaves and flowerpot are white chocolate with coloring, and the tree trunk might be a wire armature. To be authentic I’d guess the cake is dark chocolate, maybe with roots made of white coconut shreds(?) How did Taylor bake the cake shape and the dish underneath it? Thanks! The mulch/dirt is crushed oreo cookies, the leaves are gumpaste, the pot is fondant covered, and the cake is white. I was thinking Mike’s furniture being protected from chocolate-colored toddler fingers was more important at the time, but now I’m thinking authentic looks inside would have been cool! I carved the cake out of four round cakes, and the dish underneath is a real dish, which doubled as my cake plate. I posted the recipes/instructions above. Let me know if there is anything I didn’t explain well. That is a lot to try to cover in one post! What a exquisit and unique cake. I’m sure,Mike really appreciated such nice gesture. Since you are ‘in charge’ of all incoming emails, I would like to mention, how much I enjoy receiving Mike’ mails. At the same time, I wanted to let him know, that I am physically unable to raise maples, besides, we are not allowed to do backyard growing for commerical purposes. On top, even if, my garden is way to small, to even put a veggie garden in. I hope, Mike will not be too upset, I still LOVE to get his mails.’Thank you, Christa. Please wish him a belated HAPPY Birthday for me and many happy returns. Also tell him, I am old enough to be his mother. How imaginative and creative. Kudos Taylor! Will you share your recipe and instructions? Thank you very much! I posted the recipes and instructions above. Happy Birthday. Friends make these moments and life worthwhile. The cake is lovely and so full of love. What a thoughtful young lady. Thank you for sharing. Where did you find someone that’s a cute as a bugs ear, not a bad bug but a good bug? What your secret for making the pot, leaves, and stem? The leaves are gumpaste, which is what many wedding cake flowers are made from, the stems are wire covered in fondant and colored dust, and the cake is carved into the shape of a pot and covered in fondant. If you didn’t know, fondant is a thick icing, which has a clay like consistency. You roll it out and cover things with it. What a GREAT cake Taylor! Mike, if she has that much talent she needs to be in the cake business. I’d love for my wife to get me a cake like that. That is SO COOL! Thanks, Richard. I like making cakes as a hobby sometimes, but I have way too much to do to be in the business! Taylor is very talented. Amazing idea and artistic expression! Wow Taylor that cake really looks unique. Very creative. You are young, and smart! The recipe and instructions are posted above. Wow, the cake is awesome …Happy late Birthday to Mike !!! I posted the recipe and instructions above. Taylor, that is unbelievable! Love it! What do the leaves and pot taste like? The dirt has got to be chocolate. What inspired you to create this? Donna, the leaves taste like cake flowers. The dirt was Oreo I think, but under the dirt was cake. I wanted to give Mike something for his birthday, and cake is usually what I go with because I can come up with something really special for people that way. Thanks Barbara, it was really nice of Taylor to make such a special cake for me. How clever! It would be a shame to eat it but eat it I would. Would love the recipe and what kind of pans you used. Our church Agape Garden Club would love and appreciate a cake like this for some of our events. Great job! I posted the recipe above. I used four round pans 5 in, 6 in, 7 in, and 8 in. You could use any size pans, you just might have to waste a bit more cake that way. I have also heard you can back in a terra cotta pot that has been cleaned. You could look into that. Forgot to add beautiful cake I hope you print this recipw for all of us ..
Love it! My daughter is a Cake maker and she’s shown me how you do all of this with fondant. It’s amazing what can be created. I’m a huge fan of Buddy Vallastro, Cake Boss and this looks just as good as one of his cakes! I can watch ya’ll do this and still wonder how you do it. I made her 1st birthday cake with a sheet cake and lattice work and 1 tier and she was off and running! LOL Great job! Hi Mike, Happy Birthday Mike, dont have the words to describe that cake of taylors except AWSOME. That really is very cool. Good job!! Can I get a cutting? I just want to know HOW to make this. It’s great! I posted the instructions above. I’m sure I didn’t cover every step, but I tried! Vey cool happy late birthday Mike. We are dying to hear how she did that cake. I posted the recipe and instructions above, under the first post. Please send the entire recipe. Cake, leaves, pot and all. This would be great for our garden club event. Kay, I posted the recipe and instructions above. Taylor, that is a terrific-looking cake. You are clearly a very talented young lady. I’m truly impressed by the branches and leaves. That’s so pretty I’d really hate to have to eat it, but if it’s *half* as good as it looks, I’m sure it was amazing. Well Mike a happy belated birthday to you and kudo’s to Taylor for such a wonderfully creative and surprising cake. Keep up the good work you two. I saw this and wondered how did she grow a tree with the leaves even, in a pot? I was awed, even more so, after i saw it was a cake. wow! I need the recipe. please. Happy Birthday Mike I hope you had a wonderfu day. Taylor I also would like to know the details of your cake if you are willing to share. It looks unique not the normal Birthday cake which I am a big fan of different. Mike I enjoy your emails and am getting my place set up so I can order the Japanese Maples. Are these the tree or bush variety??? Feliz cumpleaños – Happy Mapple Birthday! Yummy and adorable birthday cake! Happy Birthday to you, Mike! Happy to know about the cake and recipe posted by Tylor.It is very interesting.Mike, thank you for your tips. Let me wish you happy birth day!. I thought you are elder than me,but it is not the case. I am over 62 now and will reach 63 on July next!. In our place ,India climate is far different from your place and actions may differ. Any way I will try your tips. I am trying to inform my friends about you and your projects. That is one very talented baker, your Taylor! I would never even think about attempting such a thing! And I just had a birthday, too,Mike! Taylor, this is obviously a labor of love for you. The detailed instructions you gave are incredible. Thank you–and you go, girl! Very cool and unique. Happy Birthday Mike! Will be cranking up your system soon. Troy, I hope you do! I think you’ll really enjoy the experience, not to mention some extra income. Happy Be-lated Birthday Mike! Thank you for your great advice. Excellent job Taylor! Taylor, you are an culinary artist bar none! Awesome creation . . . ! By the way my birthday is in May . . .LOL! Happy Birthday Mike! You fit your cake well! Cool cake, Taylor! Keep being inspired. Wow! This is marvelous!!!! How very creative and realistic!!!! Happy Birthday Mike! Happy Birthday to you Mike. I am glad you had a great one!! Great job on the cake Taylor, A very unique idea. Sounds like Mike does love his Japanese Maple. I hope to have a chance to get some started one of these days. Love your Birthday cake!!! Thanks for sharing. Taylor, CONGRATULATIONS on a spectacular artistic endeavor, That cake is a masterpiece! for such an indept description of the process, baking this cake..
and maybe some occasional little ‘tidbits’ from you, Taylor. You both have a great day. Happy Birthday and hope u have many more and taylor you did a great job on making the cake. like some of the other people said it is nice having a good bunch of people around that care about you. Is japanesemaplelovers.com no defunct? I am having all the mail returned.